Fabric and networking is what will set the Dell EMC PowerEdge MX apart from many of its competitors. 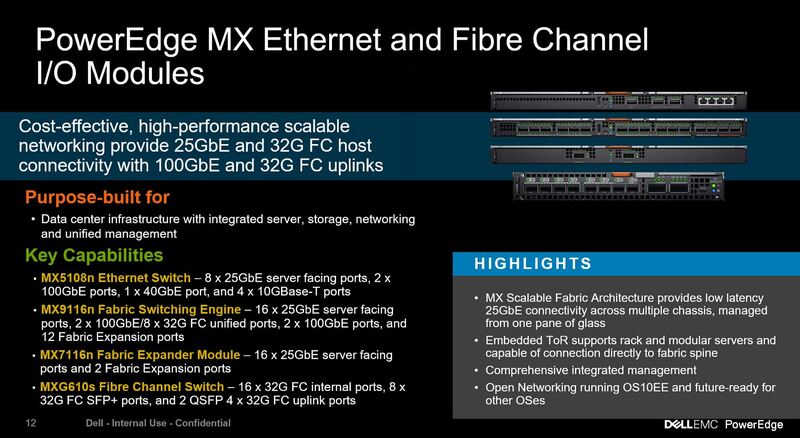 At launch, the PowerEdge MX is designed to use 25GbE as the base, although it supports 32Gb Fibre Channel I/O as well. Internally the PowerEdge MX7000 I/O subsystem has redundant fabrics called A and B. Each sled has mezzanine slots that align with A and B fabrics. In this example, we can see the A fabric mezzanine is populated, while the B mezzanine connector is not populated. Our test system only had fabric A populated. Here there is a PowerEdge MX9116n fabric switching engine on top with the PowerEdge MX7116n fabric expander module below. In this configuration, each of the eight blades connects to the top MX9116n. That MX9116n handles all of the switching logic. 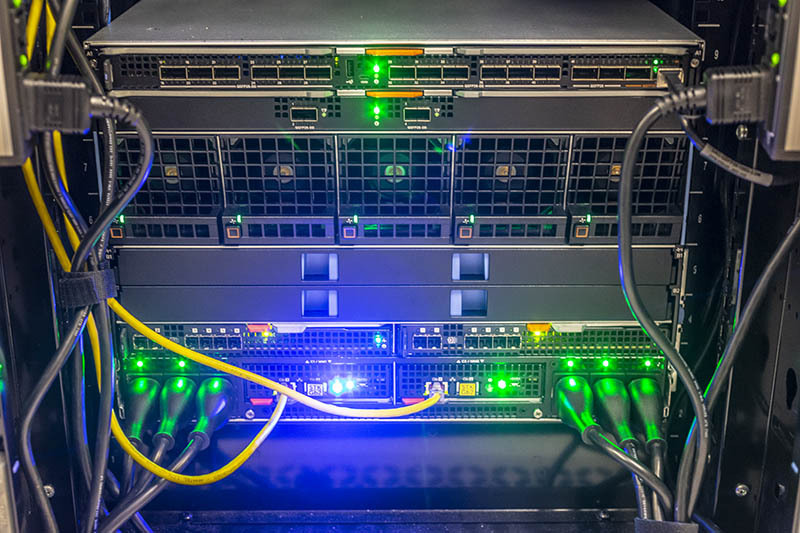 The MX7116n is there to connect to the other Dell EMC PowerEdge MX in Dell’s Santa Clara Customer Solution Center. Using the MX7116n fabric extender, one can uplink to a switch in a different chassis. Although there are only two ports on the MX7116n, each is a QSFP28-DD cage, capable of 200Gbps operation. If you are doing the math, 200Gbps * 2 ports = 400Gbps. 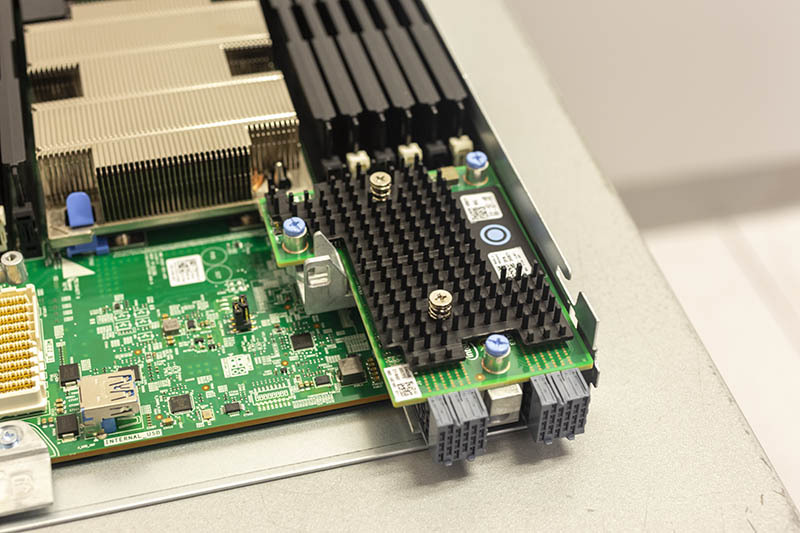 400Gbps/ 25Gbps = 8 or a 25GbE connection for each of the blades in the chassis. Using these fabric extender modules, one can have switchless PowerEdge MX chassis instead using fabric extenders to link to the switching elements in other PowerEdge MX chassis. 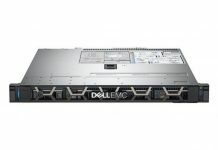 That is a great design that can help lower costs and complexity of PowerEdge MX deployments. 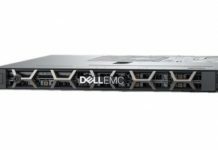 I have been a big proponent that despite what Dell EMC publicly acknowledges, the PowerEdge MX is ready for completely new paradigms such as Gen-Z. 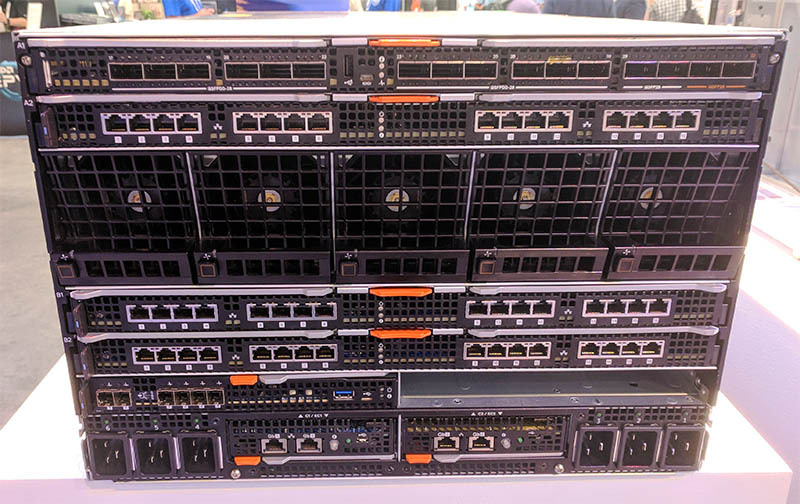 If you contemplate a Gen-Z or 400GbE future, the PowerEdge MX makes a lot of sense. If you do not want to support either and both, then the PowerEdge MX may be overkill. The top unit looks like the PowerEdge MX9116n. The three horizontal network I/O modules each have sixteen RJ-45 connectors. Those are likely 10Gbase-T pass-through I/O (non-switched) modules. While Dell EMC may officially say there are four modules, there are certainly others at least in some stage of development out there. Future modules with 50GbE-400GbE, Gen-Z, and etc. 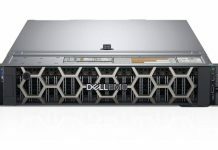 are possible with the PowerEdge MX design without needing to swap the midplane. Next, we are going to look at storage for the PowerEdge MX.